Sample no. 5502 from the "Mineralogy and Petrography Museum Grigore Cobălcescu" of "Alexandru Ioan Cuza" University, Iaşi. Below spectra are various settings, and other vibrations of barite (which are not present in this spectrum). The Raman spectrum of barite consists in an intense ν1 band which corresponds to the symmetric stretching of SO4 tetrahedra at 989 cm-1. The other characteristic bands, ν2, ν3 and ν4, were found at: ν2 - 461 cm-1; ν3 - 1085 cm-1, 1143 cm-1 and 1167 cm-1; ν4 - 619 cm-1 and 648 cm-1. These values are similar to those reported in the literature. The peak corresponding to the symmetric stretching mode (ν1) of the S-O bond in the sulfates appears to be the strongest in the Raman scattering intensity. The wavenumber of a Raman shift is determined by the bond strength and the atomic masses (Fadini and Schnepel, 1989). Therefore, the ν1 wavenumber is a function of S-O stretching force constant in sulfates and increases with an increase in the force constant. The force constant of SO4 tetrahedra were calculated from the bond lengths and the infrared absorption frequencies by Miyake et al. (1978). Figure 1. Wavenumber of the ν1 vibrational Raman mode vs. atomic mass of the cations for barite group. The stretching force constants are: for barite K = 6,27 md/Å; for celestine K = 6.34 md/Å; and for anglesite K = 5.98 md/Å. Therefore, this systematic wavenumber shift is largely due to the increase of mean force constants because of substitution of larger cations in the M sites (Lee et al., 2005). Also, the wavenumber decreases with an increase of the atomic mass of the cations. 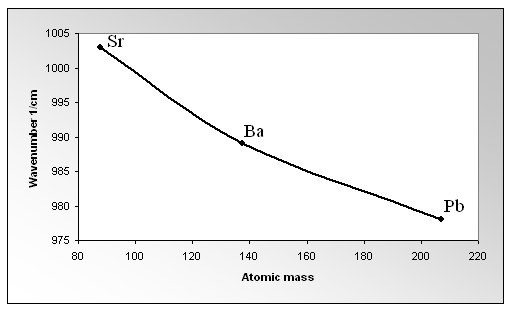 An example for ν1 mode is presented in figure 1, where the atomic masses are: Sr = 87.62 u; Ba = 137.32 u; Pb = 207.2 u. • Fadini, A., Schnepel, F. M. (1989) - Vibrational spectroscopy methods and applications. Ellis Horwood Limited.